This new exciting model is called the D20R and with the upgrades the sound quality has improved in all areas. Improvements comprise of a new cabinet with bass loading used in D30 and D40 models. A new crossover network and a ProAc ribbon tweeter as used in D30 D40 K6. 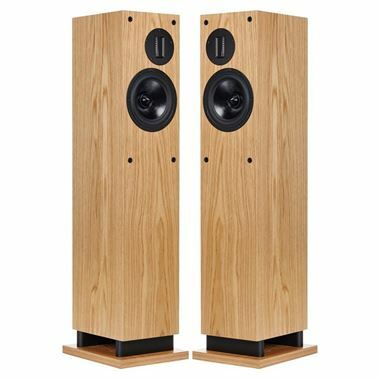 The result is a wonderful open and expansive midrange with a substantial bass, ProAc ribbon tweeter giving sweet and detailed high frequencies, a large sound stage is also a bonus. Bass Driver: 6.5" (165mm) ProAc unit fitted features glass fibre weave cone, Excel Magnet system and unique acrylic damping phase plug. Tweeter: ProAc ribbon 60mm by 10 mm as light as a human hair, with rear chamber damping. Crossover: Finest components on dedicated circuit board. Multi-strand oxygen free copper cable throughout. Split for optional bi-wiring or bi-amplification.